I forgot how to, and it took me some time to remember. I decided to itemize my steps in a blog post. Ensure that you got a video camera that can playback MiniDV tapes. A Firewire (IEEE 1394) interface in your PC or laptop. A Firewire cable that connects your video camera with your PC or laptop. Capture your videos using Windows Movie Maker or WinDV. This will create raw AVI files on your hard drive. If you ended up with multiple AVI files you wish to concatenate, use VirtualDub. Append your videos using the Append option in the File menu. Ensure that under the Audio and Video menu options, you select the Direct Stream Copy option. 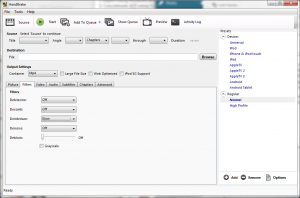 Encode your AVI video using HandBrake. Default options are fine (H.264 for video, AAC for Audio). Just ensure that the Deinterlace option is ON under Filters; Slow is fine. I recommend you keep a backup of both the raw AVI files and the MP4/M4V file you have created. You can even upload them to YouTube (as private for instance) and share it to the ones you care.